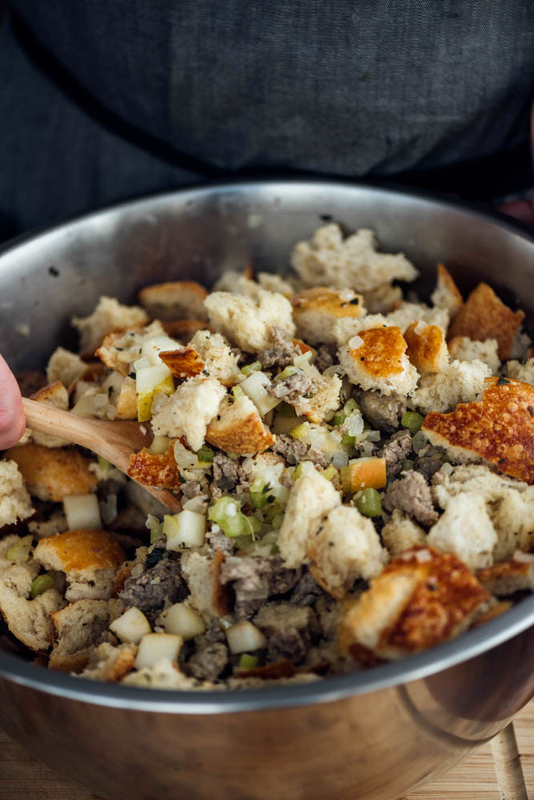 Everything you need to know about making the ultimate stuffing — from recipes and tips, to step-by-step guides to mastering the classic. 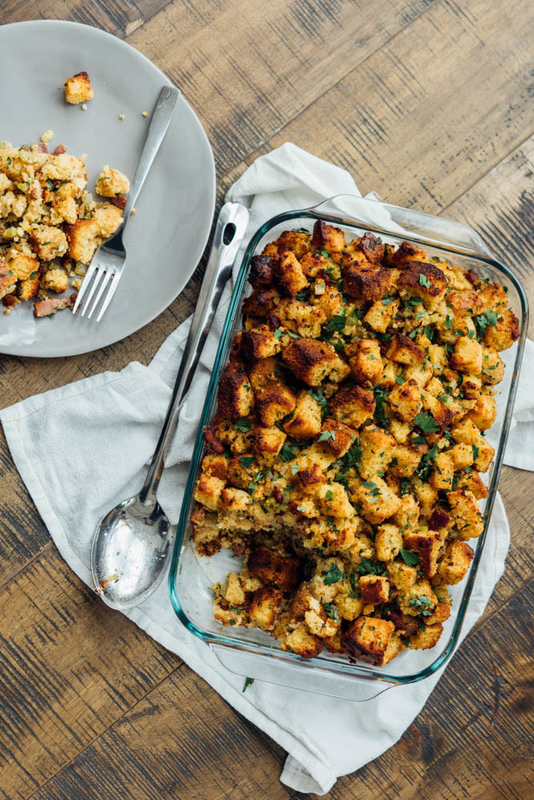 Move over turkey, because everyone knows that stuffing is the best part of Thanksgiving. I mean, it's basically savory bread pudding — what's not to like? But stuffing comes in many shapes, sizes, and flavors — and it takes a bit of practice to perfect. So we went ahead and made a lil' cheat sheet completed with four recipes to get you started. • Classic Stuffing: Because we wanted to create a recipe that tastes similar to the boxed variety, only better. • An Amped-Up Classic: Because sometimes you gotta impress your in-laws, and this recipe will do just that. 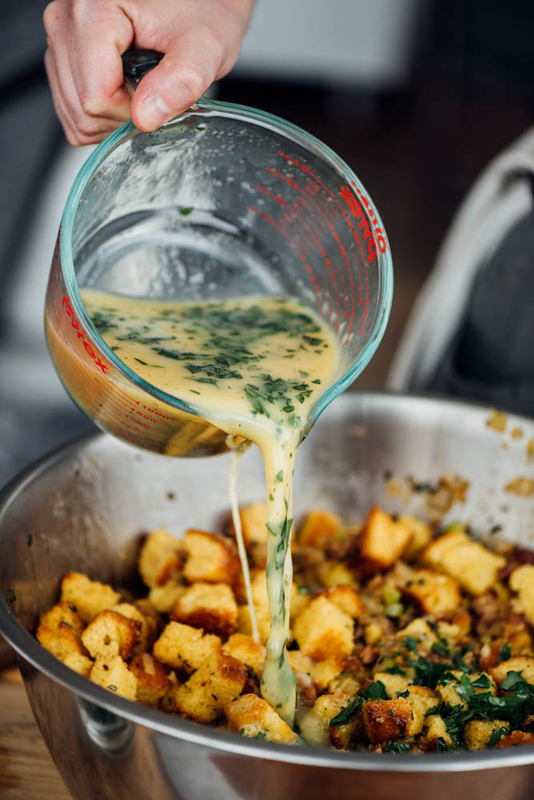 • Cornbread Stuffing: Because cornbread stuffing is a category all on its own. 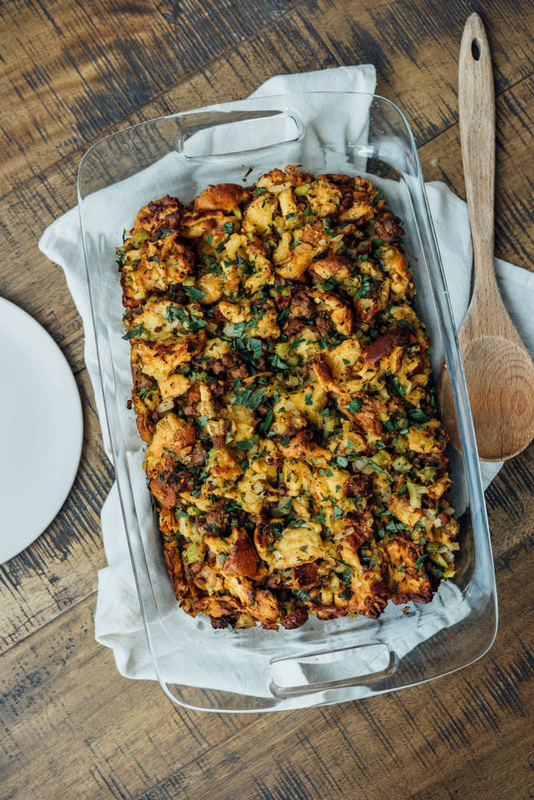 • Vegetarian Stuffing: Because Thanksgiving is all about making food everyone can enjoy, so there needs to be a go-to recipe that is both vegetarian and delicious. First thing's first, the bread. It's not so much about what kind of bread you use, but how you treat it. Rule number one of a good stuffing is to rip your bread, do not dice it! (Cornbread is the exception — but we will talk about this later.) This gives your stuffing way more texture and helps it get a crunchy top. The second rule is to dry it out. You can either rip it up and leave it uncovered overnight, or pop it in a 325°F oven for 25 minutes. The goal is to dry it out enough so that it doesn't turn to mush when you mix it with the other ingredients. 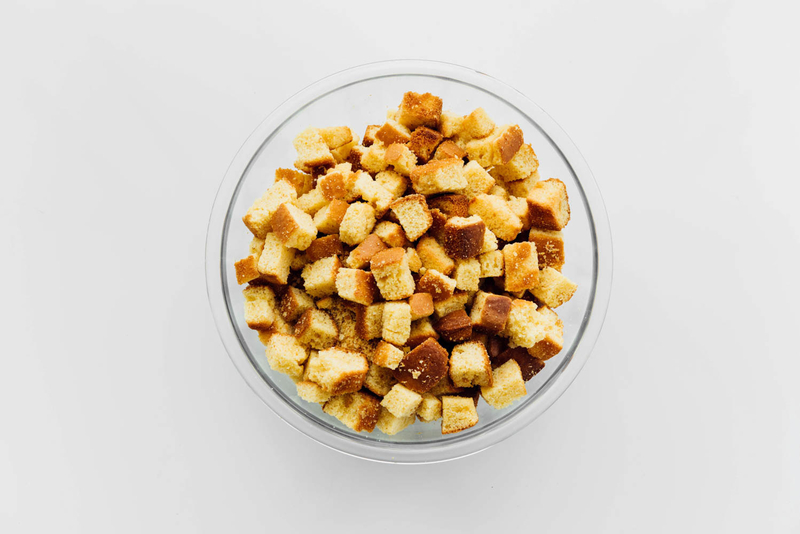 You want it to be almost as dry as a crouton. We ripped 'em all up and dried them in the oven. You can get creative and use just about any bread you want — challah, walnut bread, and pumpernickel would all be great options. You can also use gluten-free bread, just make sure to really dry it out so it doesn't get too soggy (as some gluten-free breads have a tendency to fall apart easily). 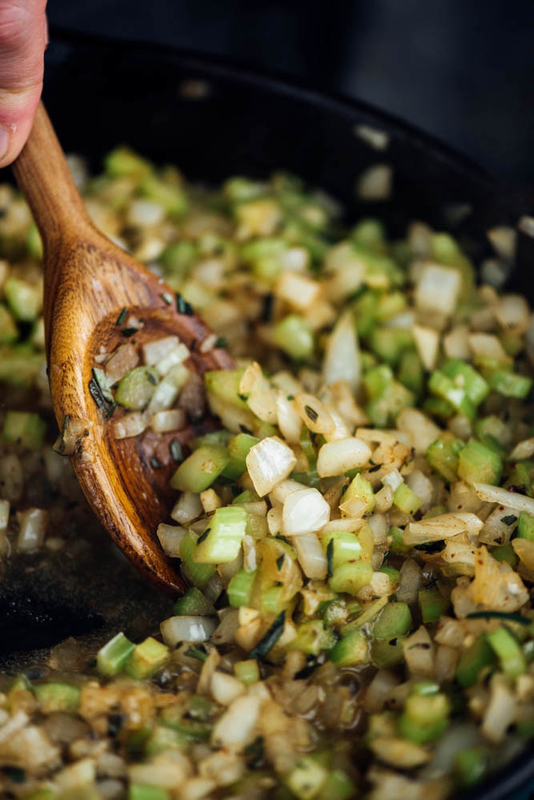 Ask just about anyone what the base of stuffing is, and they'll answer: celery, onions, garlic, and herbs cooked in butter. 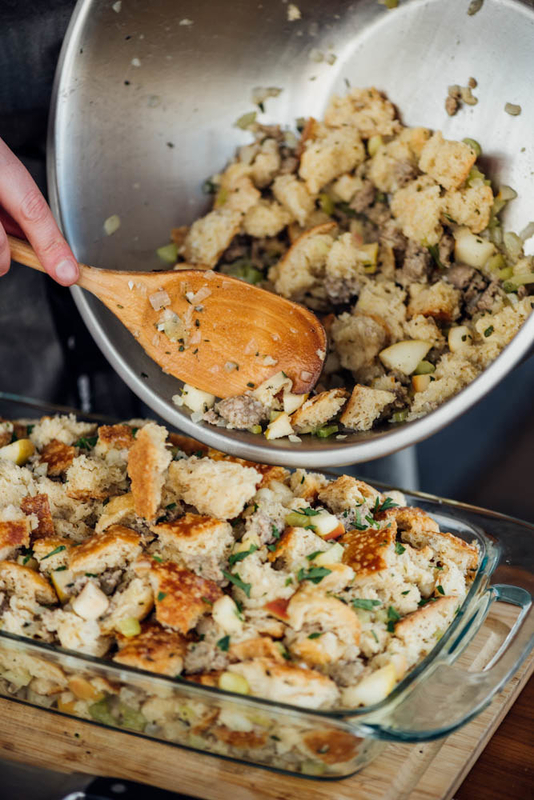 We stuck with this classic combo to build the foundation of our stuffings and used a combination of sage, rosemary, thyme, and oregano throughout (changing the combination to fit the flavor profile). Stick with this base and you'll be on your way to stuffing perfection. Now it's time to boost the flavor and add something meaty. This can be bacon, sausage, or even mushrooms. The goal is to add a punch of savory flavor to round the whole thing out. Sure, herbs and veggies are great, but you'll need a little something extra. Other go-to's include ground beef, crab, chorizo, even oysters — basically anything that will add a hearty dose of flavor to your stuffing. Now we'll need something to moisten everything up and bind it together. For each of our recipes, we stuck to a ratio of three cups of stock and three eggs. We seasoned that mixture with salt and pepper, and added some parsley to add freshness and pizzazz. You could of course use beef, seafood, or any other stock depending on what flavor direction you're headed. And feel free to print this chart and stick it to your fridge for impromptu stuffing making! 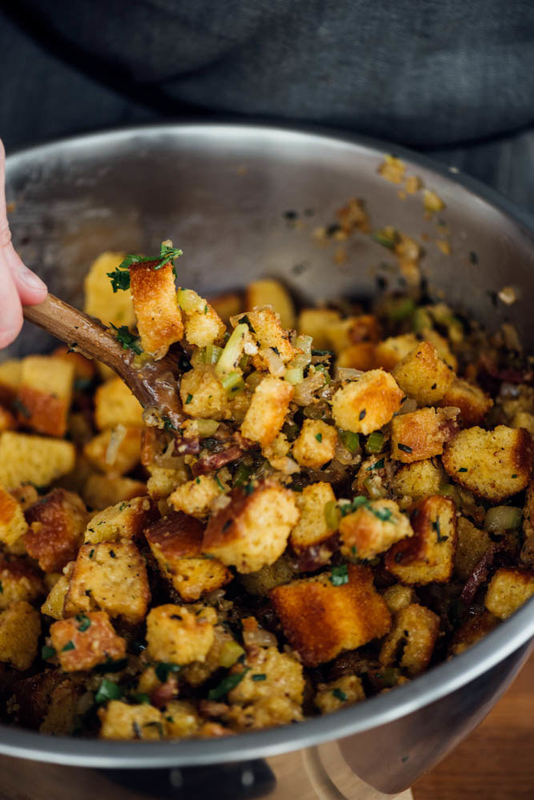 Now that that's out of the way, let's dive into the recipes — and remember, as long as you follow the four main rules of stuffing, the dish is pretty forgiving and great for riffing on. AKA the classic. It's crowd-pleasing, simple, and unfussy. Think of boxed stuffing, only ten times better. 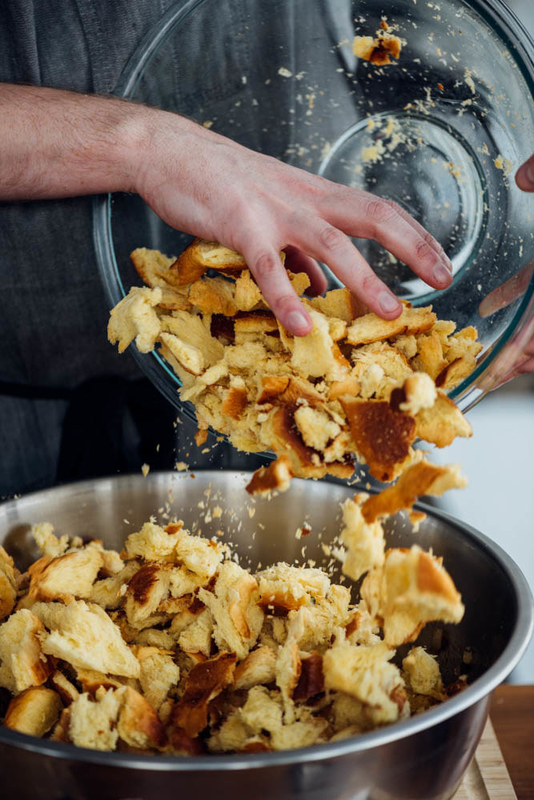 Start by ripping up two loaves of brioche and drying them out. Remember, you can do this by leaving them out overnight or by popping them in a 325°F oven for 25 minutes — your choice. Then melt some butter in a skillet and start browning some sausage. It may seem like a lot of fat, but the bread will soak it right up. Remove the sausage, add celery, onion, garlic, and herbs, and cook until fragrant. Toss all of that together with the dried bread, then mix eggs, stock, parsley, salt, and pepper in a separate bowl. Pour that over the bread mixture and toss to coat. Transfer that into a casserole dish and bake. Once it comes out, garnish with some parsley and you're good to go. 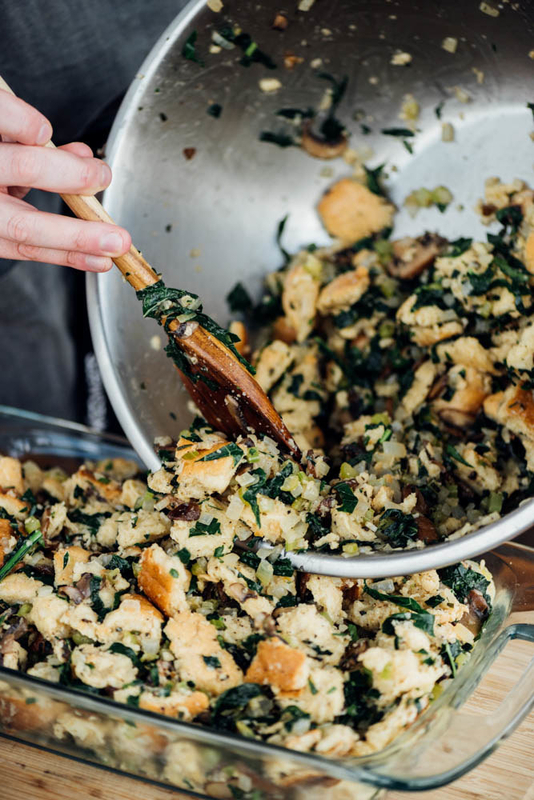 And there you have it: a classic, comforting stuffing just about everyone will love. • Good for: Large groups, when you need a crowd-pleaser. Fans of the boxed varieties. • Bad for: People looking for something unexpected. AKA the amped-up classic. We added fresh apples, sage sausage, and used sourdough bread to add a cheffy touch. It's sweet, savory, and will impress just about anyone. 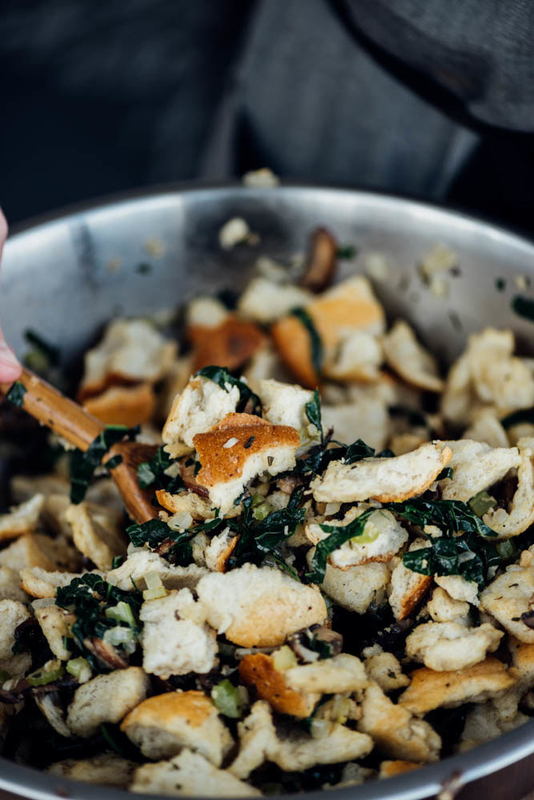 Start with ripped up and dried sourdough bread — this will add an extra depth of flavor to the stuffing. 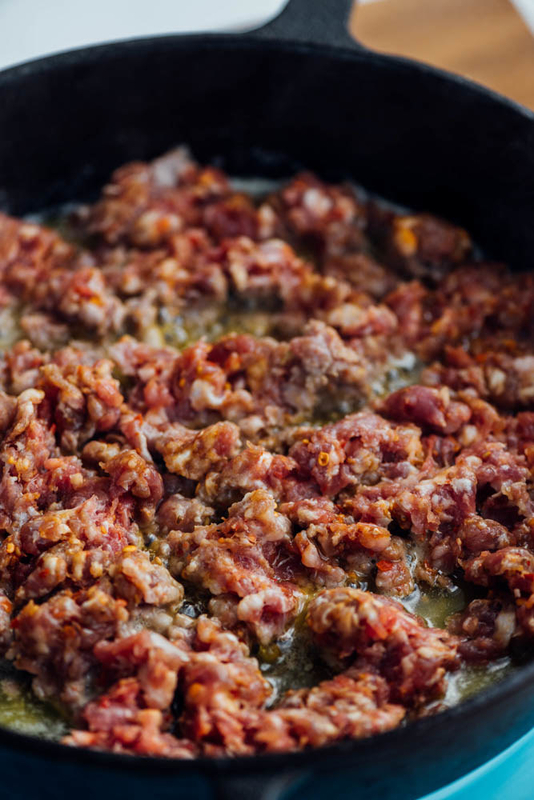 Then melt some butter in a skillet and start browning some sage breakfast sausage. 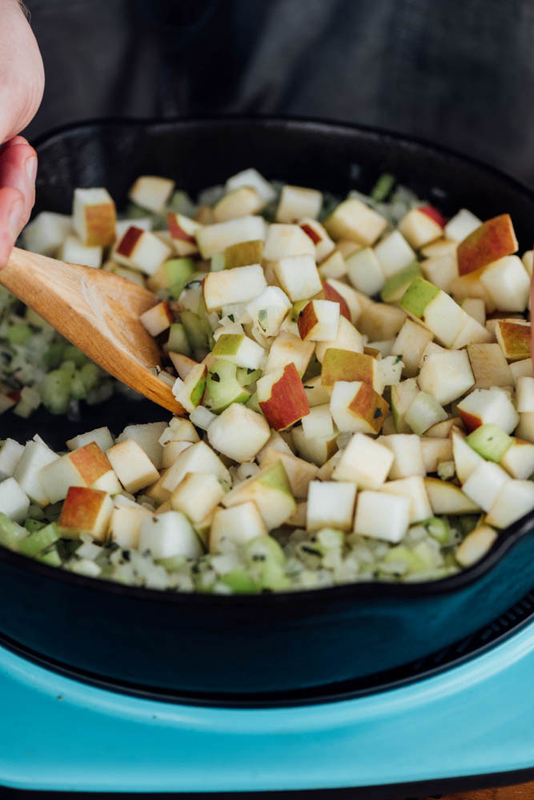 Remove the sausage and cook diced apples, celery, onion, garlic, and herbs in the rendered fat. 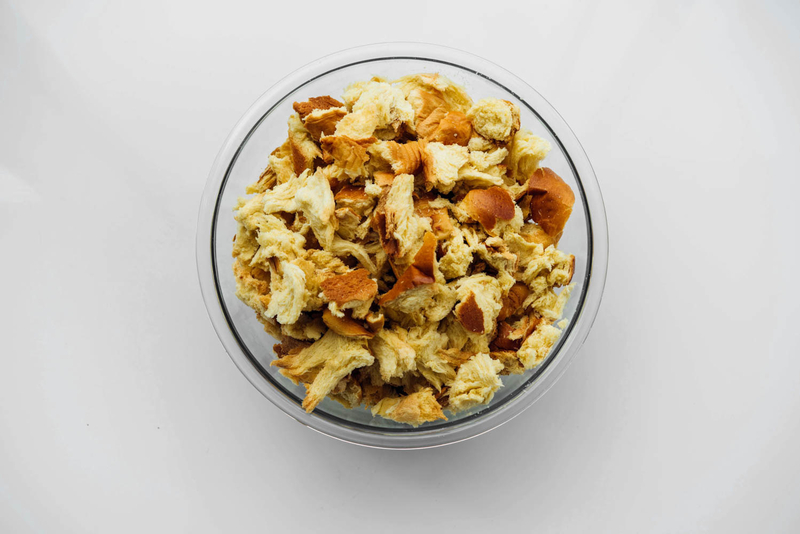 Toss that mixture with the dried bread, then mix up your egg and stock mixture in another. Pour it over, toss to coat, and transfer into a baking dish. You'll know this one is done baking once the apples start to brown and shrivel up a little. This means they're cooked, sweet, and full of flavor. Once browned, garnish with some parsley, and serve. The apples will be sweet and tender — the perfect addition to savory stuffing. • Good for: People looking to add a little something special to their table without going crazy. • Bad for: People who don't love sweet and savory flavor combinations. Instead of ripping the bread, cut it into cubes and dry it out. If you try to rip it, it'll just crumble apart. Then melt some butter in a skillet and start cooking some chopped bacon. You want it to get crispy and render out all of it's fat. Remove that from the pan, then add your veggies (onion, garlic, celery, and herbs) and cook until tender. Toss that mixture with your dried cornbread, mix up your stock mixture, and pour it over. Transfer to a baking dish and pop it in the oven. The cornbread will get nice and golden and the bacon will get even crispier. Sweet, savory, and drenched in bacon fat. What's not to like? • Good for: Cornbread stuffing purists. Lovers of sweet and savory flavor combos. AKA the vegetarian version. 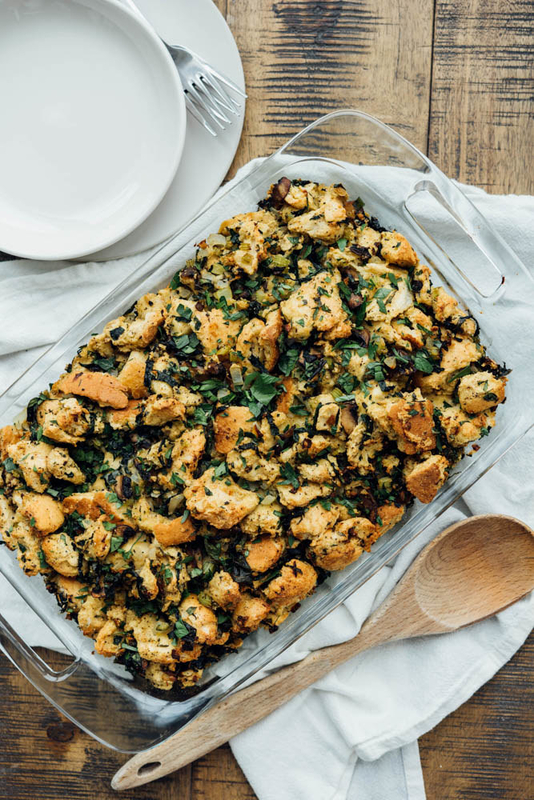 We wanted to create a meatless stuffing option that still tastes amazing. This way, it'll make both the meat eaters and the veggie lovers happy. 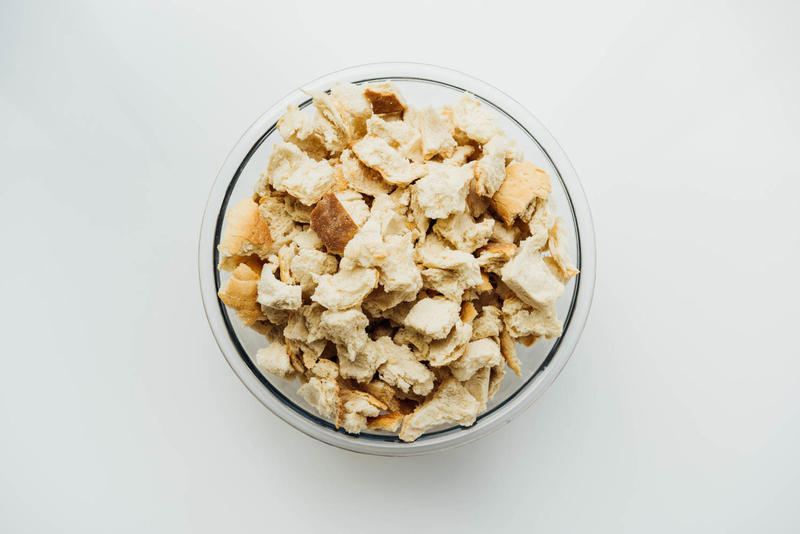 Start with ripped up and dried country bread — this can pretty much be any good white bread (but definitely not squishy sandwich bread). 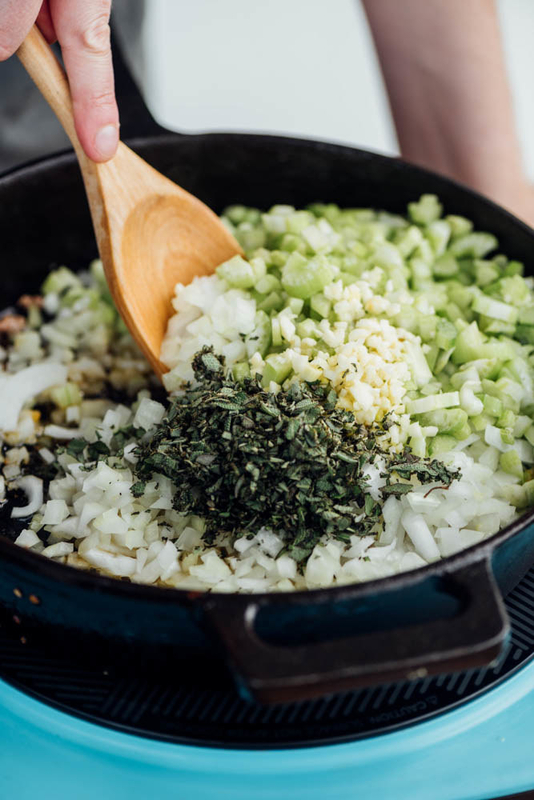 Melt some butter in a skillet and cook your onion, celery, garlic, and herbs. Once those are tender, take 'em out and add mushrooms. Cook until browned and add kale until wilted. Toss all of the cooked veggies with the bread, then mix up some veggie stock with eggs. Pour it over the bread mixture, toss to coat, and transfer into a baking dish. Bake until golden, then garnish with parsley. • Good for: Vegetarians or people looking to cut down on meat. • Bad for: People who hate mushrooms. 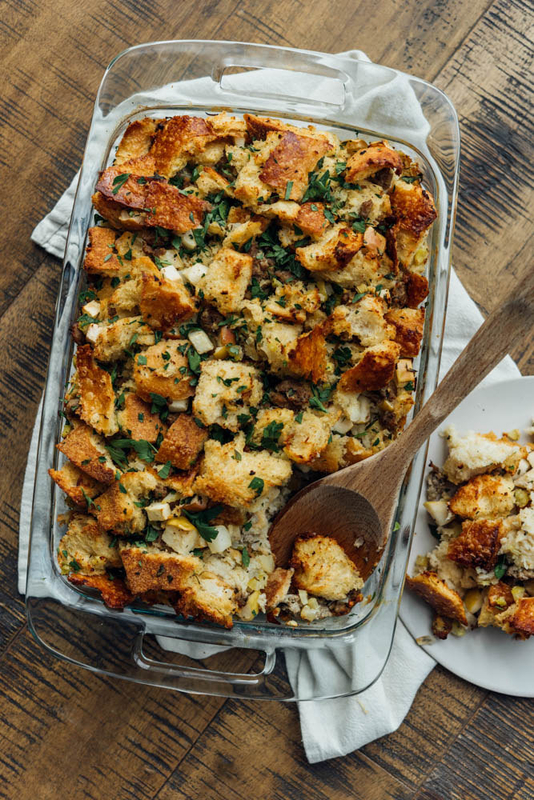 So there you have it: A stuffing recipe to please everyone. Pick the one your family will love and get cooking — or use the simple rule of four to create your own! So go forth and conquer stuffing! You got this! 1. Preheat the oven to 425˚F (215˚C). 2. Melt the butter in a large skillet over medium heat. Add the sausage and cook until browned and no longer pink, about 5 minutes. 3. Add the celery, onions, and garlic and cook until softened and golden, about 5 minutes. 4. Add the oregano and sage and cook until fragrant, about 2 minutes. 5. 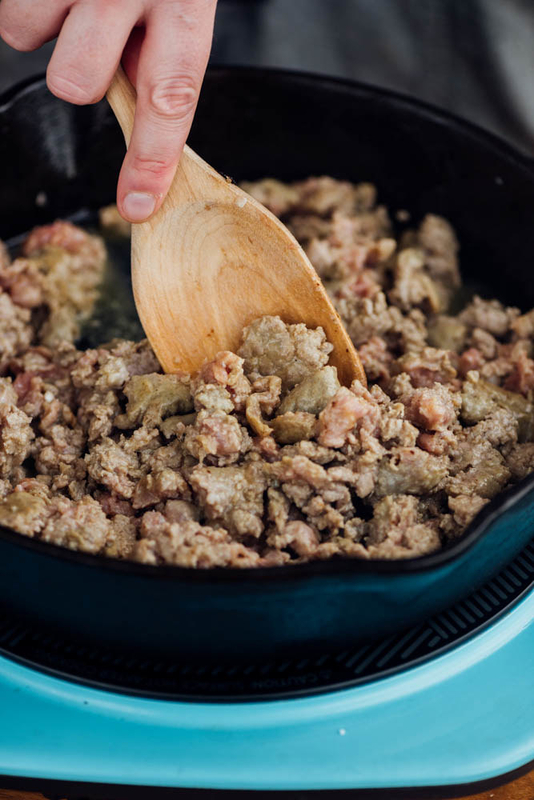 In a large bowl, combine the bread and cooked sausage mixture. 6. In a medium bowl, beat together the eggs, chicken stock, half of the parsley, the salt, and pepper. 7. Pour the egg mixture over the bread and sausage mixture and stir to coat. 8. Transfer the stuffing to a 9 x 13-inch baking dish and cover with foil. 9. Bake for 30 minutes, then remove the foil and bake for another 15 minutes, or until the top is golden brown. 10. Top with the remaining parsley. 1. Preheat the oven to 425˚F (220˚C). 4. Add the apples, sage, and thyme and cook until slightly softened, about 3 minutes. 6. In a medium bowl, beat together the eggs, chicken stock, salt, and pepper. 7. Pour the egg mixture over the bread and vegetable mixture and stir to coat. 2. Melt the butter in a large skillet over medium heat. Add the bacon and cook until the fat has rendered, about 3 minutes. 3. Add the celery, onion, and garlic and cook until softened and golden, about 5 minutes. 4. Add the thyme and rosemary and cook until fragrant, about 2 minutes. 5. 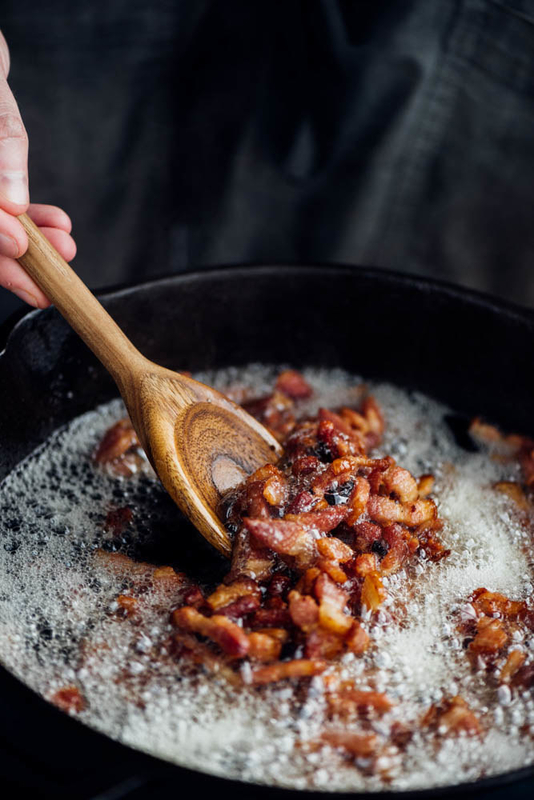 In a large bowl, combine the bread and cooked bacon mixture. 6. In a medium bowl, beat together the eggs, turkey stock, half of the parsley, the salt, and pepper. 2. Melt the butter in a large skillet over medium heat. 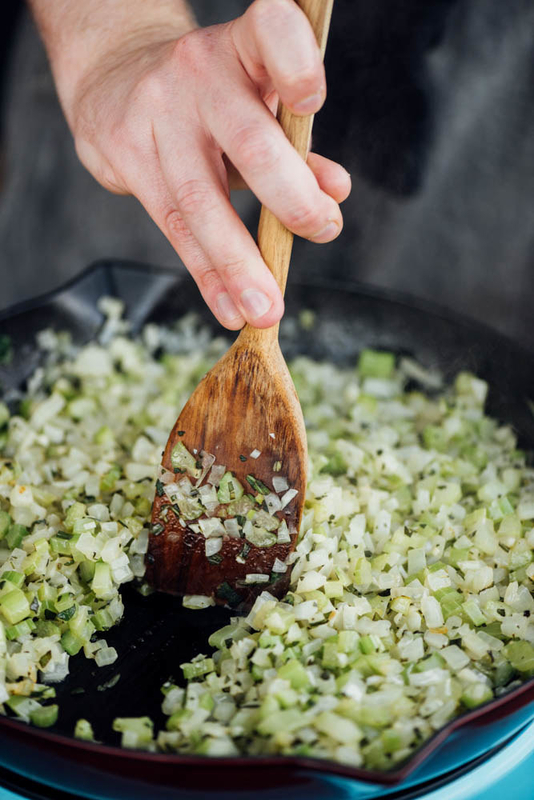 Add the celery, onions, and garlic and cook until softened and golden, about 5 minutes. 3. Add the mushrooms and cook until softened, about 5 minutes. Add the kale, sage, and rosemary and cook for another 5 minutes, until the kale is wilted. 4. 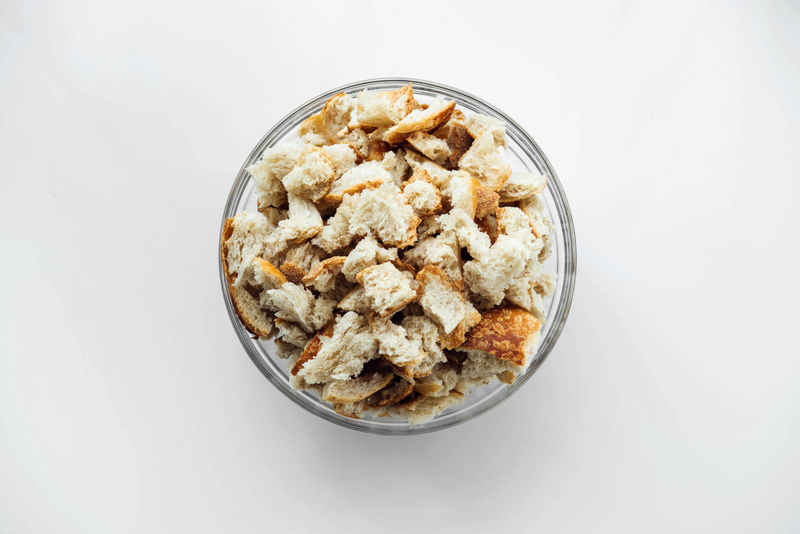 In a large bowl, combine the bread and cooked vegetable mixture. 5. 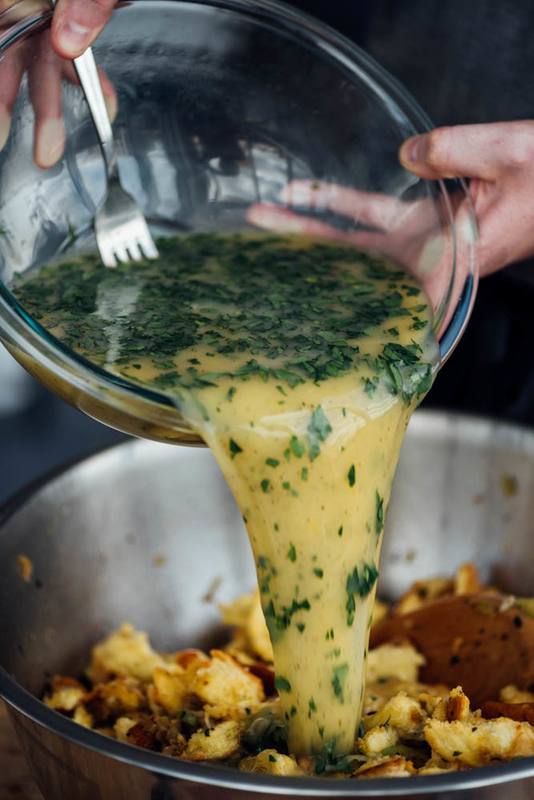 In a medium bowl, beat together the eggs, vegetable stock, half of the parsley, the salt, and pepper. 6. 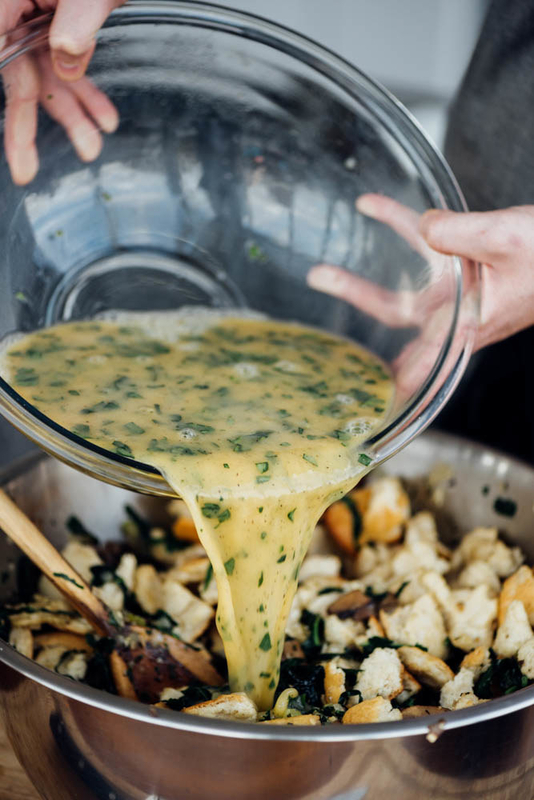 Pour the egg mixture over the bread and vegetable mixture and stir to coat. 7. Transfer the stuffing to a 9 x 13-inch greased baking dish and cover with foil. 8. Bake for 30 minutes, then remove the foil and bake for another 15 minutes, or until the top is golden brown. 9. Top with the remaining parsley. And if you're looking for more Thanksgiving recipes, tips, and tricks, check out our Tasty-est Thanksgiving to help make this Thanksgiving the best one yet.